The LG V40 Thin Q is expected to launch in India buy the end of January. 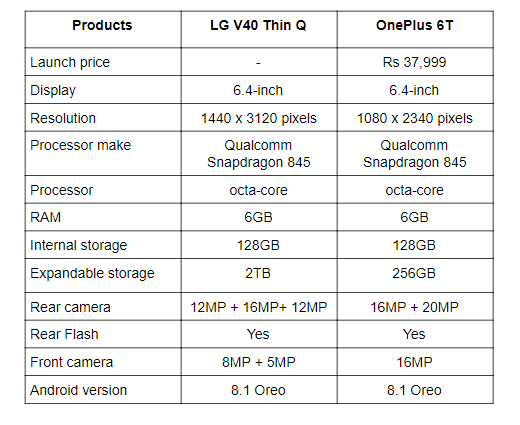 We are comparing the LG upcoming flagship phone with the OnePlus 6T to see whether the phone will able to give a tough competition to one of the popular devices of the same segment OnePlus 6T at least on paper? The LG V40 Thin Q is expected to come to India at around Rs 45,000 (appx). However, the company has not mentioned at what price they will launch the smartphone in India. The device is powered by Qualcomm Snapdragon 845 processor and has a 6.4-inch QHD+ display. 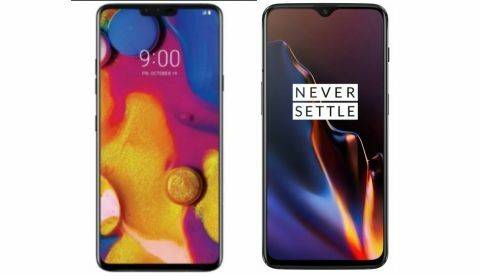 On the other hand, we have one of the most popular devices “OnePlus 6T”, which was launched last year at a price of Rs 37,999. It is also powered by the Qualcomm Snapdragon 845 processor and sports a dual camera set up at the back. Let’s do a quick comparison of the two to know which device got the best under its hood in terms of hardware. Both the smartphones feature a 6.4-inch display. However, the LG V40 Thin Q offers a better 1080 x 3120 pixels than the OnePlus 6T that comes with a resolution of 1080 x 2340 pixels. When it comes to the processor, the LG V40 Thin Q is powered by the Qualcomm Snapdragon 845 processor, which is paired with 6GB RAM and 128GB internal memory that is expandable to up to 2TB via a microSD card. On the other hand, the OnePlus 6T is also backed by the same Qualcomm Snapdragon 845 processor. The device packs 6GB RAM and 128GB internal memory, which is expandable to up to 256GB via a microSD card. As far as the cameras are concerned. One of the main highlights of the LG V40 Thin Q is its triple camera set up at the back. The phone has a 12MP primary sensor, a 16MP ultra-wide angle sensor and a 12MP telephoto sensor along with a dual 8MP + 5MP camera setup on the front. When it comes to the OnePlus 6T, the phone has a dual 16MP + 20MP rear camera with a 16MP unit on the front. The LG V40 Thin Q is expected to launch in India in four color options Platinum Gray, Aurora Black, Moroccan Blue, and Carmine Red. You can get the OnePlus 6T in India for Rs 37,999 via Amazon.